These scrumptious Scottish salmon Fingers are delicious on their own but even better when dunked in this honey dill sauce. Not only are they tasty to eat, they are fun to make. Perfect for children and adults alike! 1. Sift the flour onto a plate or into a wide bowl, beat the eggs in another bowl and place the breadcrumbs in a third. Season each with salt and pepper. 2. Dust the salmon strips in the flour, then dip them in the beaten eggs and finally in the breadcrumbs. Make sure that they are evenly coated so no salmon flesh is showing. 3. To shallow fry, heat the oil in a large frying pan on a medium-high heat. 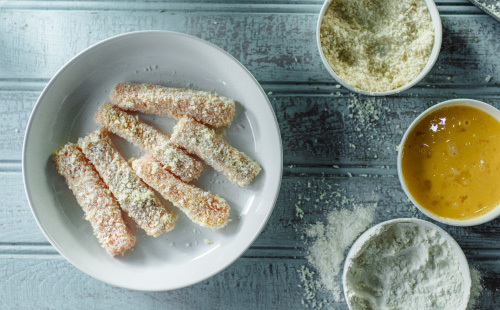 Fry the salmon fingers for 3-4 minutes each side or until crisp, golden and cooked through. Drain well on kitchen paper. 4. Meanwhile, prepare the honey dill dip. Mix together the mayonnaise, honey and dill then place in a small bowl or ramekin. 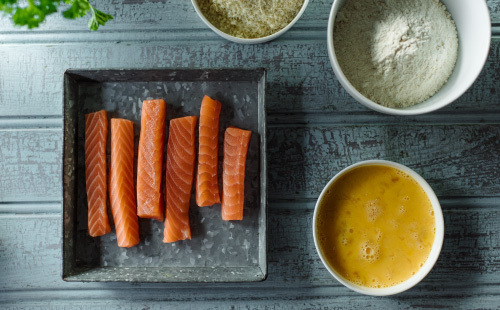 Serve with a side of mushy peas and wedge of lemon to drizzle over the salmon fingers.